Eli August is a busy man. Over the past few months, he spent a week working as a background actor in Steven Spielberg's Abraham Lincoln biopic, was hired as a cast member on documentaries for big guns such as the History Channel, and just this Spring he and the ever-amazing Davenport sisters released a joint CD. The guy even makes his own Victorian-themed soap. Seriously. Amid all of this, he's consistently putting out his own quality music on a regular basis. 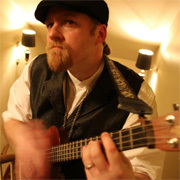 His most recent solo release The Bottom of the Sea perfectly captures his dedication to lyrical and melodic excellence. This six song collection employs the ocean as metaphor for the tumultuous crests and troughs of life and relationships, in particular those moments when troubles threaten to pull one beneath the waves. Steampunk music comes in many flavors, and August's music is a perfect counterpoint to the more dance-oriented, aggressive club sound. While certain other bands pour on the sonic layers--and sometimes confuse them for depth--August strips them away, until it seems even his soul is laid bare in each song. The EP leads off with "A Nautical Mile". Immediately it's clear this is not a CD of harmless sing-a-long shanties, but is instead a far more mature listen. Eli's vocal delivery is haunting and poignant over staccato acoustic guitar and lingering accordion as the song grows in intensity. The lyrics literally tell of a crew's relentless journey through all manner of trials, but speak on a deeper level about the endless hunt for contentment. "Dead Reckoning", both the second track and my second favorite song on the CD, has a clipped guitar rhythm to it carried by djembe and tight wordplay. This tale of love gone wrong portrays a fast-moving relationship where the speaker is taken so far away from what he knows that he may never find his way back. I found the use of the real-world nautical/aviation navigation term as metaphor was especially apt. It asks the question: how can you go back to who you were if you can't even remember who that was? The ocean metaphor is used to greatest effect on "The Deep", easily the heaviest song--emotionally--on the EP. August captures feeling of hitting bottom, of living in a state of crushing pressure and bizarre state of existence. Once again he spins real-life science into the piece. Through lines such as "The lights that you see, my friend, they are not stars." --referring to the bioluminescent lures used by the most hideous bottom-dwelling predators--he creates a cautionary tale, saying, simply: even when you've arrived at your lowest point, don't clutch blindly at the first hint of salvation. It could actually spell your doom. The fourth track, "The Plunge", could easily be 20,000 Leagues' Captain Nemo reflecting on his state of being. "Waves" begins patiently, adrift like the characters it portrays, soon building to a desperate, multi-layered crescendo--then fading away. Mr. August's confident, stripped-down approach is best represented on the E.P's final track, "Steady". Some of the other tracks touch on hope's presence. Here, hope is at the forefront. We find a protagonist not just enduring a troubled relationship, but pressing onward to better things. Guided only by August's unique voice and a mere five chords on guitar, the song echoes "each ebb and flow" as the protagonist strengthens from the experience. Using so little, so much is said. I'm finding it hard to come up with a complaint about this EP.. It sticks to its theme and executes it very well, with a raw heart present in every note. Perhaps the first track could have use a bit less reverb on the vocals and allowed them to come more to the foreground. I'm also a percussion fan, so I would have liked perhaps some subtle percussion on the tracks besides "The Plunge" and "Dead Reckoning". Then again, you can chalk up the latter to personal taste and some excessive nitpicking on what is a marvelous collection of songs. In short, what we have here is an American folk musician at the top of his game, writing uncompromising songs with a real depth of character.